Whether this feature has been in iOS since the beginning or not, this is the first I’ve heard of it, so I’m guessing there are a few of you out there that haven’t found the sleep timer in iOS, either. If you want to listen to music or audiobooks before you go to sleep, it’s generally a good idea to have a way to turn the music off after you’ve fallen asleep, right? Well, it turns out that there’s a sleep timer right in iOS itself, but it might not be where you’d expect it to be. Instead of finding the sleep timer in the Music app, which can play music, podcasts, videos, and audiobooks, you’ll find it in the Clock app. Launch your Clock app with a tap, and then tap on the Timer button in the lower right. Once there, set the timer for however long you want your media to play. Next, tap “When Timer Ends,” and scroll all the way to the bottom. Tap on Stop Playing. 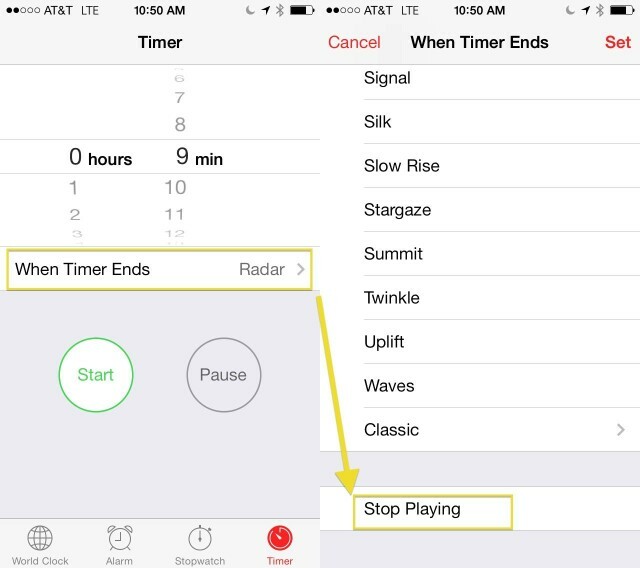 Now, when you’re playing music at bedtime (or whenever, really), your iPhone will stop playing all media on your device when the timer runs out. The Stop Playing option may also work with other media apps, though the results are varied. Some folks report Spotify not working with this feature, while others say that YouTube obeys the Stop Playing command. You’ll have to try it out on your own iPhone to see which third party apps work and which don’t.